Pastilla, bastilla, bisteeya… However you spell it, this Moroccan dish—composed of layers of sweet, orange flower-scented almonds, scrambled eggs, and chicken all encased in a flaky shell of cinnamon and powdered sugar-dusted phyllo—is far from ordinary. Or at least, my very humble conception of ordinary. I first came across a recipe for pastilla in Ruth Reichl’s memoir, Tender at the Bone. Titled “Mohammad’s Bisteeya,” it immediately caught my attention with its startling combination of both sweet and savory ingredients and seemingly laborious preparation. I knew I had to give it a go. Nothing against Ruth’s recipe, but I figured for a first attempt, I’d stick with a more detailed source of instruction in the form of a YouTube video. The recipe I ended up using comes from CookingWithAlia. The only major differences between Alia and Ruth’s recipes are that Ruth uses ginger and lemon juice in her eggs, while Alia makes the addition of orange blossom water in her almonds. I’m a huge fan of anything orange blossom (and I just happened to have a rather neglected bottle of it sitting in my pantry), so I gladly took the plunge with the special ingredient. I failed to take a photograph of the bottle, but for reference, I used the Indo-European brand. The recipe starts out quite familiarly with sautéed onions, parsley and spices (cinnamon, ginger, turmeric, and saffron—which I omitted for...let’s just say, frugality). Next came the braising of a whole chicken in the onion and spice mixture. 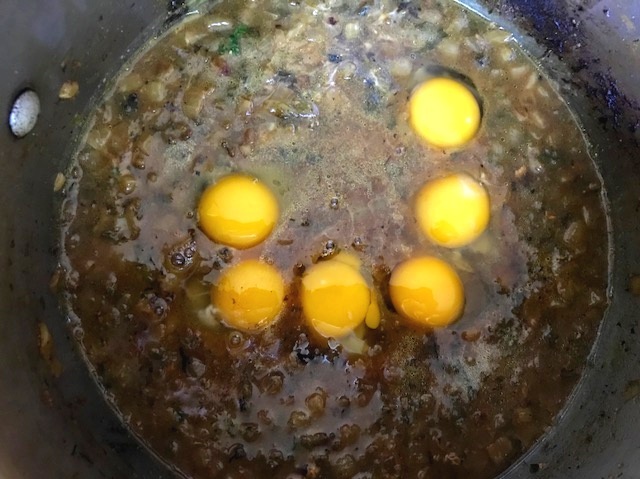 Following the removal of the fully-braised chicken from the pot, I added in six eggs which were scrambled with the remaining liquid to yield a brownish-green mush. It didn’t look great, but it tasted amazing— kind of like the filling of a spiced quiche. The chicken was shredded, and the scrambled eggs set aside. For the almond layer, I toasted blanched, slivered almonds in some oil until golden brown, removed them from the oil, then pulsed them in a food processor with some powdered sugar and orange blossom water. I snuck a taste as soon as the motor stopped running and woah… it reminded me of marzipan but ten times better. Toasting the almonds provided a rich nuttiness while the orange blossom water added a hint of floral complexity. I could eat spoonfuls of it, and I would be amiss if I said that I didn’t. Finally came time to assemble the pastilla. Layers of butter-brushed phyllo were laid down in the bottom of a round pan, followed by the eggs, more phyllo, the shredded chicken, more phyllo, the almonds, more phyllo, and finally, even more phyllo to wrap up and secure the whole thing. After a final brushing of butter and egg yolk, the pastilla was subjected to a 350 degree oven for 30 minutes. Then it was left to cool, dusted with powdered sugar, and decorated with the signature diamond-shaped trails of cinnamon. If you’ve ever had pastilla, you’ll know what I mean when I say that it is rich. Rich but utterly delicious. The eggs, chicken, almonds, and phyllo all come together to create a very flavorful and texturally varietal experience that is unlike anything that I have ever had before. The powdered sugar and cinnamon actually work really well in this recipe. I had expected them to confuse the dish into a strange meat pie-dessert hybrid, but they really do complement the savory elements perfectly. For those up for a unique recipe, this is definitely one to try.